The White Hart Inn is currently thought to have been the inn where the Great Bed of Ware was first recorded. In 1600 the ‘host’ was Nicholas Bleake as recorded in his will dated 17th November 1600. He came from Ware; he is described in his will as Nicholas Bleake of Ware in the County of Hertford, yeoman. Why would the landlord of an inn, set in a small market town, leave a will? Well, Nicholas Bleake was probably not a typical landlord. He was a mapmaker. There is a copy of his map of 1582 in Huntingdon Record Office. It is a survey of Kimbolton for Edward Wingfield, a man who went on to become governor of Virginia. Kimbolton Castle was where Catherine of Aragon was imprisoned by Henry VIII and where she subsequently died. His will also says that his late uncle is Thomas Birch, (granted the Priory in 1548? ), and he has bought a house in Mill Lane, now Priory Street, together with his cousin James Birch. His will seems to suggest that he was well off; he left individual legacies totalling £13, equivalent to ~£35,000 now if measured by average earnings. He is owed £70 by ‘my Lor d Cromwell of Emmeswelle in the County of Norfolk’. But Nicholas Bleake features in other documents. 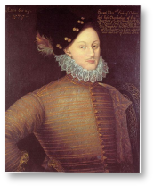 He is named as Oxford’s servant in a lease granted to him by Edward de Vere, 17th Earl of Oxford in 1580. Oxford seems to have lived beyond his means. He had been well connected with Queen Elizabeth, but fell out of favour. He was Lord Great Chamberlain. He was married to Lord Burghley’s daughter, Alice Cecil. He had an illegitimate son by Anne Vavasour, one of Queen Elizabeth’s maids of honour. He would surely have known Thomas Fanshawe, who had an estate at Ware Park and was Remembrancer of the Exchequer, an ancient judicial post whose primary duty was to keep track of tax payments . Nicholas Bleake was recorded as Oxford’s Attorney, as was Simon Ive, and his name appears on many manuscripts as a witness. He was also involved with some court cases in respect of land owned and sold by Oxford in his manor at Earl’s Colne. The landlord of the White Hart moved in the very highest circles in England. He is named in documents relating to Oxford’s debts in the sum of £400, ~£70,000 now using RPI, or £1,000,000 using average earnings. This is in a judgement presided over by Sir John Popham, Attorney General – the man who tried Sir Walter Raleigh and Guy Fawkes. 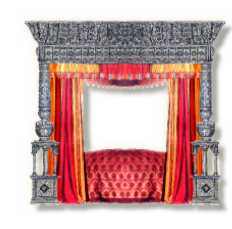 The bed has a connection with Shakespeare as we know, and there are some who doubt whether Shakespeare was the true author. The current prime alternative candidate is Edward de Vere, Earl of Oxford! And indeed, whether you believe the authorship issue or not, de Vere was a poet and playwright, so may well have known Shakespeare. So are we left wondering if any of this might give a clue to the provenance of the bed, and here we move into the area of speculation. It may well have been commissioned by Nicholas Bleake as a tourist attraction, but could it have been once owned by de Vere who seemed to be someone who wanted to impress and found himself in debt, or could it even have had a connection with Thomas Fanshawe, maybe not at Ware Park, but at Place House, in Ware, where he was thought to have lived for a while? A fascinating man, a fascinating story with much left to be discovered.